The Bolt-on Monolift by Titan is a rack mounted lift assist compatible with the Titan X-3 Series Power Racks. Save money on a dedicated monolift by adding one to your existing rack! The Monolift design allows the counter weight handles to drop the hooks as soon as you take the bar. The hooks drop out of the way so you can exercise in place without having to walk the bar out from your JHooks. Re-racking is just as easy, a short lean forward re-racks the bar. Under weight, the monolift returns to its original position. Reduce the possibility of injury and go for max reps with a Titan Monolift! A monolift attachment does not replace spotters or proper technique. We recommend ONLY using a monolift attachment with a rack that is bolted or secured to the ground for safe use. - The Titan Monolift drop away design keeps you in control of your squats. 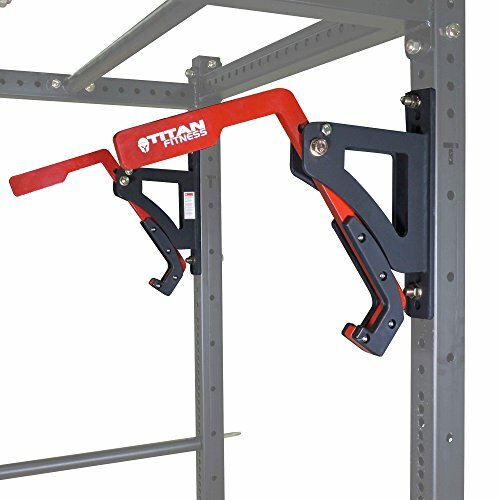 - Recommended for use inside Power Rack in conjunction with spotter bars for a safe lifting environment. - Bolt in mounting style allows you to create a dedicated Monolift squat station. - Mounting hardware included. Fits 2" Hole spacing and Westside hole spacing. - UHMW liners on the jaw and bracket protects your bar knurling and upright. - Bolt hole size: 5/8"
The Titan Monolift drop away design keeps you in control of your squats. Recommended for use inside Power Rack in conjunction with spotter bars for a safe lifting environment. Bolt in mounting style allows you to create a dedicated Monolift squat station. Mounting hardware included. Fits 2" Hole spacing and Westside hole spacing.